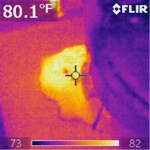 Safely locate overheating components in electrical systems, expressed as hot spots in thermal images. 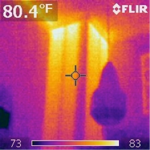 Inspections both inside and outside structures show you the location, shape and intensity of insulation. Reducing air leakage, or the uncontrolled movement of air into and out of a building is also important because it can compromise the efficiency of building environmental systems. 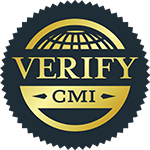 While best measured with pressurization testing, infrared scans can quickly pinpoint leakage points. 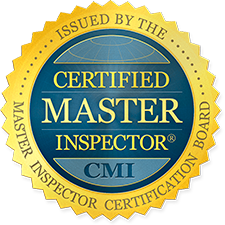 Inspections inside and outside of structures, along doors, windows, vents and pipes, immediately show you areas of infiltration and exfiltration. 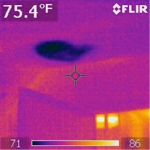 Moisture intrudes through joints and cracks in roofs, ceilings and walls, and is trapped, resulting in structural rot and mold, some of which may represent serious health hazards. 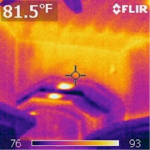 Regular infrared inspections, inside and outside of structures, are therefore critical to quickly locate cold spots, which are often signs of moisture intrusion. 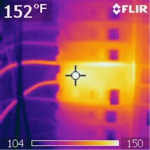 Infrared camera inspections can help you quickly locate support beams, pipes, electrical cables, and flues in poured walls, floors and ceilings. 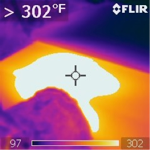 Simply scan surfaces, and detailed thermal images clearly show you subsurface details. 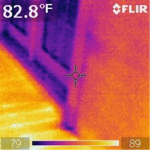 In summary, there are a number of reasons why you should add an Infrared (thermo) Camera Scan inspection to your Home Inspection. 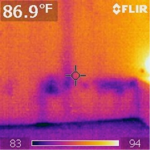 Most importantly, infrared scans can save you a lot of time and effort in locating existing and potential problems, which can jeopardize not only building performance, but also with the buildings health and safety issues.